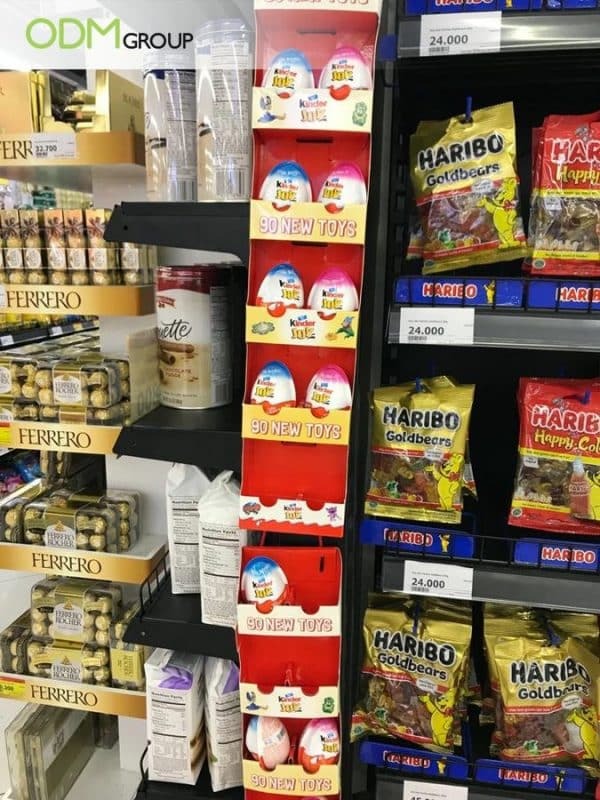 Ferrero has effectively marketed its Kinder Joy products with a custom retail fixture in Co-Op, a supermarket in Vietnam. A custom retail display can bring many benefits, including better brand visibility and higher sales. How? What Can We Learn From Ferrero’s Custom Retail Fixture? One important thing that we can learn from Ferrero’s custom retail fixture is that appealing to your audience is important. As Kinder Joy is a product mainly enjoyed by children, Ferrero has made sure to make their POS display appealing to them. Kids make use of pester power to get their parents to purchase these products, and Ferrero makes sure that kids would easily their display and toys. Another thing that we learned from Ferrero’s retail fixture design is that it is important to make your displays simple and straightforward. This prevents customers from confusion, and having to read through large chunks of text. In this custom POP display, one can clearly see that the brand is offering “90 New Toys.” Once customers see that new items are on offer, they’ll be interested to make a purchase right away. Moreover, the color of the mounted display stand shows the predominant colors used in Kinder Joy packaging. As such, when customers spot them from a distance, they’ll be able to figure out that it’s Kinder Joy. Feel free to contact ODM for all your promotional product needs! Specializing in designing, sourcing, and manufacturing, our company will definitely see to it that your marketing gifts and promotional products are done according to your business needs. Need more marketing and design inspiration? Here are some of our favorite POS Display Units blogs. Do check them out! Want to generate a buzz among customers even before they enter the store? A LED display would be perfect to light up your brand! A customized display can go a long way in impressing customers. Look just how Wrigley’s has done so with their gondola end cap display. Want a surefire way to bring in the crowd? Look no further! A twister tower display is a wonderful display tool for cosmetics, collectibles, and trade shows.